A dryline stretching from a surface low in northeastern Colorado stretching down along the Texas/New Mexico border was expected to sharpen throughout the day and shift eastward into a rather moist boundary layer with MLCAPE values approaching 3,000 J/Kg. 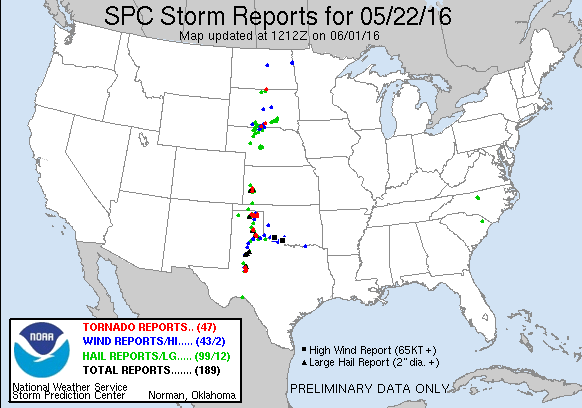 I began the day in Dodge City and my original target was Dalhart, or just east of there along the US 287 corridor. The 12z sounding from Amarillo already had 3500 SBCAPE above a pretty stout cap, but that would wear down as the day progressed. I left Dodge City around 16z and began my trek southwest. The new day 1 outlook from SPC upgraded the risk area in the panhandle to enhanced, but the upgrade was for large hail as the 5% tornado probabilities were maintained. My plan remained to get to the dryline for initiation despite some concern that there might be initiation in the warm sector to the east, but weak flow and a lack of focus made me believe the dryline was going to be the target. I arrived in Stratford just before 20z and a tornado watch had just been issued that included the entire panhandle region as cumulus had been percolating along the dryline from Dalhart towards Clovis in New Mexico. 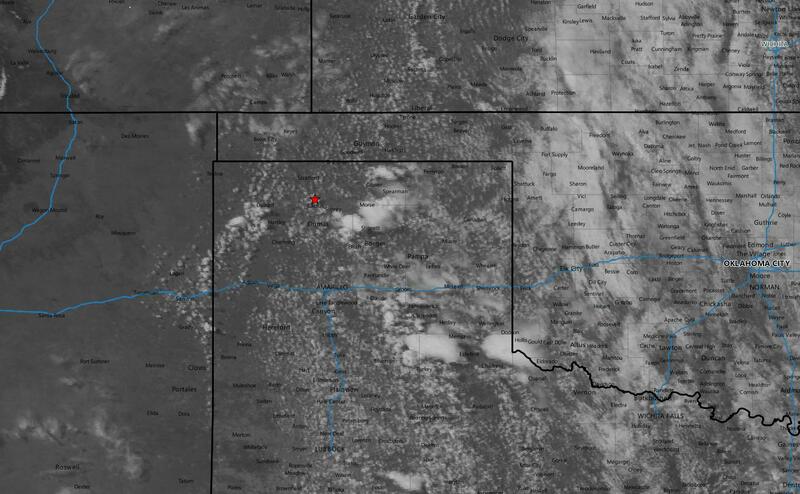 What started to concern me was the development to the east, but I decided to stick with the imminent development along the dryline and watched as the first storm that fired north of Dalhart move off to the northeast and die. Newer development along the flank drew my interest, but the same story, it’d move northeast and die. Meanwhile, far stronger convection was ongoing to my east and south and I started to wonder if the dryline storms were just not going to get it done today. 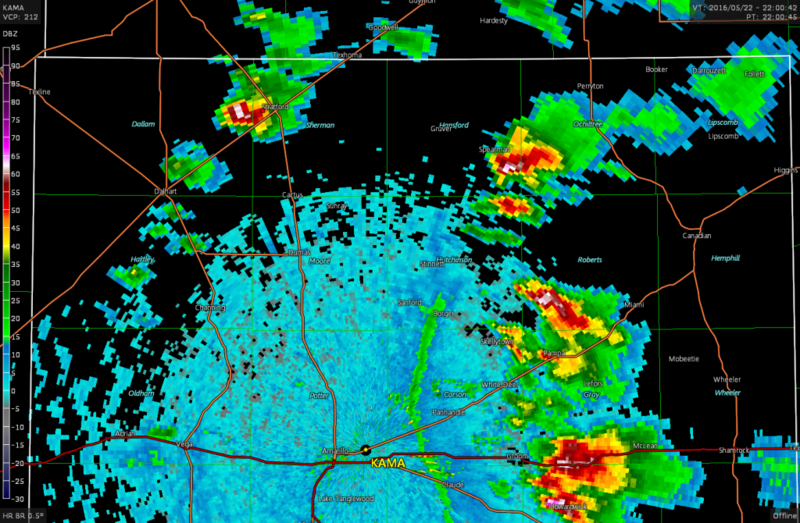 AMA radar at 22z with my location marked on the Stratford storm while more robust convection churns to my southeast. I stuck with the Stratford storm until about 2215z when it started to be the third cell to die in that area and as outflow from the storms to the east began to surge west I figured not much was destined to happen along the dryline, so I finally bailed east to try and catch up to the conglomeration of storms by Spearman. 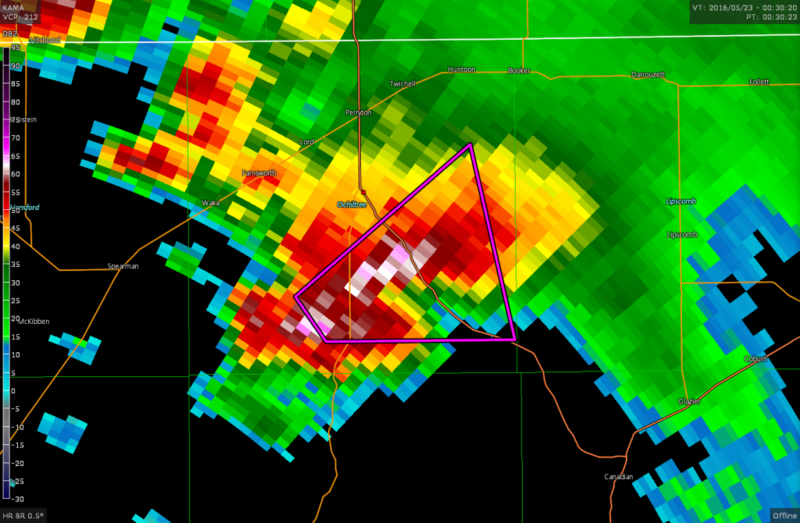 I decided to cut across the northern part of the cells otherwise I’d never get in position to view the storm. As I approached the western edge of the complex I got a pretty cool view of the storm in the distance with a sun pillar shining through onto a wind farm. While this was going on, the storm to the east became tornado warned, but it was the northernmost cell in a messy complex of storms. I continued on east past Spearman and Waka and as I approached US83 south of Perryton, with a tornado warning in progress, I had to decide to drift south on state route 70 and let the cell pass by or head southeast on US83 and try to cut across the forward flank and get into the inflow notch. 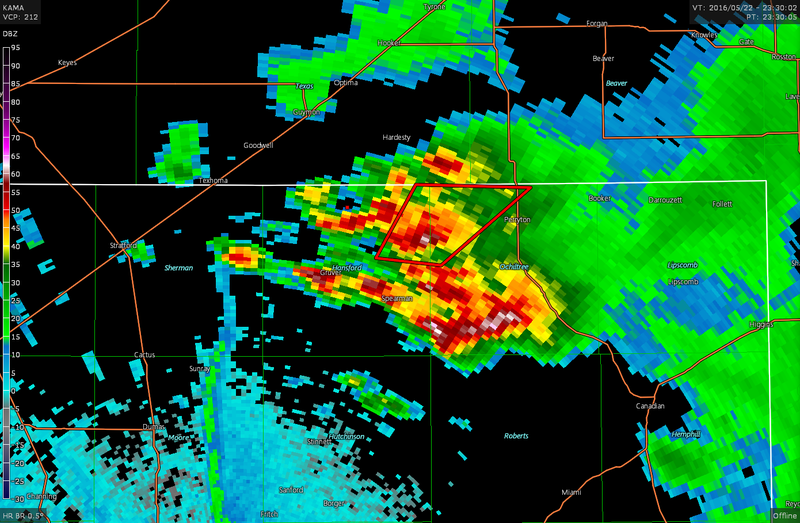 KAMA radar at 23/0030z with my position marked just south of Perryton. I opted for the latter and began to head southeast on US 83 and I eventually got into the clearing of the inflow notch and ran into Jeremy Degenhart and Mike Brady who had just got done witnessing some pretty good tornadoes on the cell. I stuck around to watch to see if the storm would wrap up and do it again. 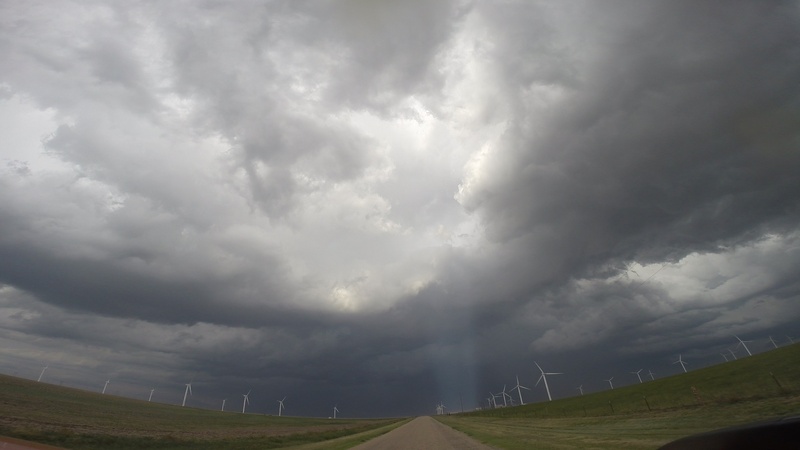 As the sun was setting, light was getting pretty scarce, but there was clearly still very strong motion and inflow into the wall cloud so there was potential I might be able to squeak out a brief tornado. But, it didn’t produce again. As darkness fully set in, I drove back to Dodge City. A decision I would regret a little bit in the morning as the target for the following day would be back in the Panhandle region and not Western Kansas like I was expecting.